Best truck tire I have ever purchased! Unbelievably quiet for an All Terrain tire! Great traction and long wear I have 60 k on them and still lots of tread! THIS IS THE SECOND SET OF TIRES I INSTALLED ON TWO VEHICLES AND WILL BUY THEM AGAIN WHEN NEEDED. THE BEST TRUCK TIRE FOR SNOW TRACTION. Tires are awesome and SUV now has much more stability than old standard tires. Plus it made my Honda Pilot a real SUV ready for any ground! Awesome tire. Would buy again! I have put these Hankook tires on my son's truck and my son-in-law is also running the same tire on his F-150. They are wearing like steel and I plan to put them on my truck next spring. 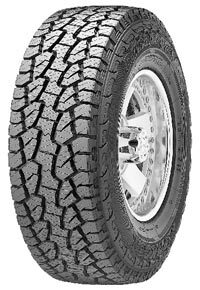 I am always in the backcountry and my Hancock tires are able to handle most every terrain and road condition. I have bought these tires consistently over the past 10 years and will continue to do so as long as I have my car. Awesome Tire! Great ride and comfort on all surfaces. Better than the BFG A/T. Will buy again. Great tread wear as well. Haven't had these tires long but so far very pleased with them. Very quiet. Little to no road noise. Handle great in the mud. Excellent combination of snow/mud/street traction. I am buying these again. Outstanding tire. Agressive look with a smooth ride. I am not overly impressed with the snow traction. I thought my Goodyear Wranglers with 45,000 miles were bad during our first snow storm, so I bought what the salesman said were the best tires for the buck, but in the second snowstorm I wished I would have saved my money. Had Hankook tires on my other Tundra, was pleased with their performance. Really good tire. I love playing in the snow with them, rarely need to put it in 4x4 to get going. Hit an oil spill on the road and got squirrely but the tires did the work on not over-correcting it. Great tire and would recommend. Long wearing tires with minimal road noise. My husband has installed Hankook tires on every car/truck for several years when the first tires wore out. He has always been pleased with the cost and savings compared with other brands. I always feel safer when I drive since no problems have ever occurred with Hankook tires on my car and his truck. I had to purchase new tires in-order to replace the crappy Goodyear Wrangler HPs that came with my truck, so I decided to go with the Hankook RF10, because they seemed to be a decent tire for a decent price. After getting these tires, I can say that they are way better than the factory tires due to the fact that they are both beefy looking and appear to be of good quality, since these tires have a pretty aggressive tread pattern along with a high 560 tread wear score. Overall, these are the best tires that you can get within this price range.